Ten strains of the genus Lactococcus were examined for their ability to remove bisphenol A [2, 2-bis(4-hydroxyphenyl)propane; BPA], which is known as an endocrine disrupter. 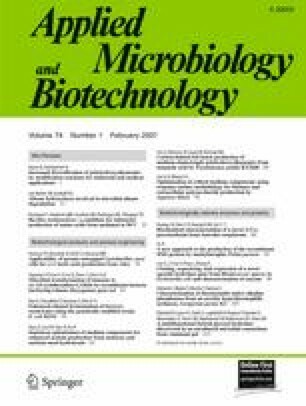 Nine strains of the lactococci tested could remove BPA from media during growth, although the removal ratio was below 9%. When BPA was incubated with lyophilized cells of lactococci for 1 h, the concentration of BPA in the media was decreased by 9–62%. Especially, the highest removal ratio of BPA was observed for Lactococcus lactis subsp. lactis 712. The lactococci could adsorb BPA but not degrade it, because the lactococci maintained the ability to remove BPA from the medium after autoclaving. When the lyophilized cells of L. lactis subsp. lactis 712 were also incubated with six analogues of BPA, they effectively adsorbed hydrophobic compounds such as 2, 2′-diphenylpropane and bisphenol A dimethylether. The BPA-adsorbing ability of lactococci could be due to the hydrophobic binding effect. The removal ratio of BPA by L. lactis subsp. lactis 712 was increased after treatment with sodium dodecyl sulfate and decreased after digestion with trypsin. These results suggest that the hydrophobic proteins on cell surface may be involved in the BPA-adsorbing ability of lactococci.